Welcome to the wonderful world of Big Fat Gypsy Weddings!This is the official book of one of the most talked-about TV series ever to have hit our screens. The show offered a unique insight into the traveller and gypsy communities, their lives, loves and their incredible wedding ceremonies. But there is so much more to these fascinating people and their culture and this book draws readers even further into an extraordinary secret world. All of the biggest, most colourful characters from the series are here - including Thelma the wedding dressmaker and Paddy the champion fighter. The book reveals what happened to some of the young lovebirds from the series - did they live happily ever after? And there's a host of new and wonderful characters to get to know too. But it's not just about weddings. This book sheds light on what it's like to grow up living on the outside of society, suffering the suspicions of settled folk and trying to preserve the traditions of an ancient culture. 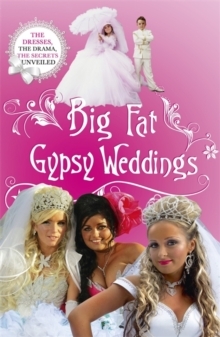 Big Fat Gypsy Weddings is a gilt-edged invitation into the heart of gypsy and traveller life, brimming with unforgettable stories and brand new insights into a disappearing world.